What is The Difference Between Accepting and Giving Up? 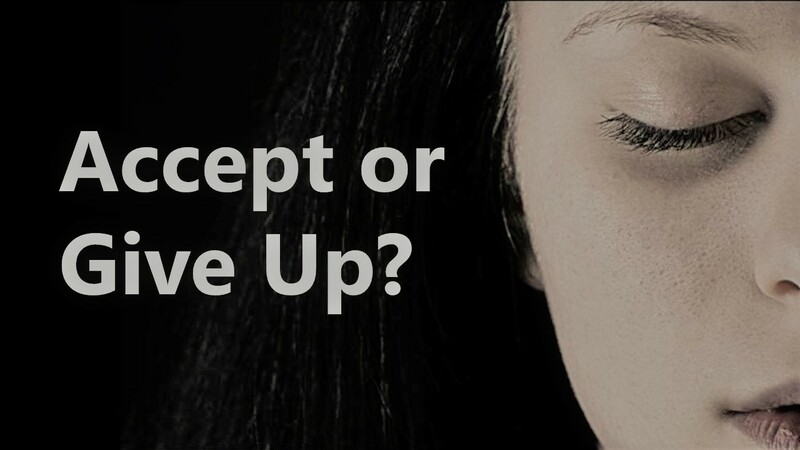 What is the difference between accepting and giving up? This can be a tough distinction for those who must bear a chronic illness, so let’s discuss it a bit. Start by identifying the things which cannot be changed. For me, the fact that I have chronic vertigo will not change. I don’t have to like it, but accepting it will help me to create adaptations for my life. On the other hand, some things can be changed, and for those areas we don’t want to give up. For me, this distinction goes a long way to helping me decide where to focus my energy. If I focus my energy on my chronic symptoms, which can be managed but not erased, then I become depressed and frustrated. If, however, I can distract myself or focus my energy toward something positive, then I find that I feel better. This could be as simple as a few small chores for the day, or if I feel pretty good, I might do a favor for a friend or a fun activity. The positive energy of doing this helps move me forward. What areas of your Traumatic Illness do you need to accept? What activities can you do to keep moving forward? We would love to hear from you! Please add your comments to the “Leave a Reply” box below. Also, we invite you to sign up for the Illness Warriors Newsletter, by clicking the “Subscribe” button at the very bottom of the page. Definitely frustrating and depressing to be focused on the hard stuff that I can’t influence or improve. Sometimes, it is hard to distinguish, so I appreciate your chart! It can be difficult to distinguish. Thanks for your comment. Your chart looks so helpful, psychologically and practically speaking. I’m thinking of my organizing clients who have Lyme disease or MS. Also ADHD. “Doing things differently is sometimes easier to start with than to accept why it is necessary.” I like that! Do I have your permission to use that thought in a blog post in the future? Thank you! I will definitely credit you with the thought. We are on the same page, Sue. I was also thinking about people who live with anxiety and other mental disorders. Acceptance (from self and from loved ones) is vital, but giving up can be deadly! It is a fine line, and one the can be difficult to distinguish for yourself.